A small submachine gun developed by Martin Tuma Engineering of Switzerland in association with the LUVO LTD of Czech Republic. 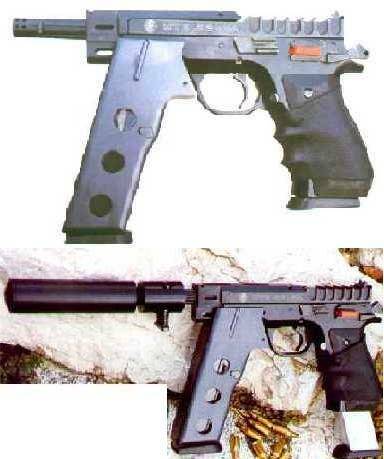 It is a select fire version of the TUMA-MTE pistol. It fires the 224-BOZ cartridge (a 10mmAuto case necked-up to accept a 5.56 bullet). It's a nice choice for those armies who need an high caliber Personal Defense Weapon for their non-combatants but can't afford the price of the FN P90s. Notice the metal fore grip: it allows in itself to be fitted an ammo magazine, in order to have a spare clip ready to use in case of an emergency. The fire selector lever is on the other side of the weapon (not seen in the picture), but it can also be used by left-handed personnel. It can also fit suppressors and high capacity magazines (see picture).